As with most wilderness skills, it is important to hone them until you can confidently use them in less than ideal situations: being able to light a fire in your backyard on a hot day is not the same as being able to light one in the jungle with it’s raining. This is a shame as flint & steel fire-lighting can be extremely useful, particularly if you are able to char materials – it’s quick, doesn’t require much physical exertion and you can carry your fire-starting materials with you. If I was in a survival situation (with only a parang) I would use, say, the bamboo fire saw to light my first fire and then either carry fire or switch to flint & steel for all subsequent fires. In the video below I show you how to use the flint & steel technique even without your striker… or an ideal flint… or charcloth ( or, for that matter cloth)… or a tin… and how to use it with non-charred materials you can find in the jungle. If you’re new to flint & steel it is a fun skill to learn and easy to pick-up (compared to friction-fire methods) if you’re using ideal materials. There are plenty of videos on Youtube that clearly explain the basics so I haven’t gone over the same ground here. Again great video. In this vid you mention that you have only been able to catch a spark on charcloth when using the bamboo strike-a-light. Well, you may want to try it how they do it in the Philippines. The fishtail palm fluff is treated with very finely powdered charcoal and a small amount of ash(essentially turning it into a kind of charcloth). Unfortunately there are no species of schizostachyum(the only ones that produce sparks) bamboos in Puerto Rico so this is one technique I don’t get to practice. Let me know how it goes if you give it a try. Thanks for another interesting comment – I am definitely going to try what you suggested. I’d read that adding powdered charcoal helps but was never sure why the ash is added too…any ideas? The bamboo strike-a-light technique is not that easy to do unless the bamboo is very dry (and some pieces seem to work better than others) – I used a flint (with charcloth above the flint) and ran it in a long scraping motion down the bamboo to light it. I have to admit that it took quite a lot of goes before it worked! Anyway, I’ll go and cut some bamboo this afternoon and dry it out (I don’t want to use the blowpipe too much for this as it spoils it), and then I’ll give it a go with the fishtail/charcoal/ash combination you suggest…I’ll let you know how I get on! How do the orang asli make their blowpipes out of bamboo? In my part of the world they are made from two perfectly matched pieces of wood (usually black palm wood wich is also used to make bows) with matching grooves carved in each half then sealed with resin and wrapped with split vines. A lot of work!!! The temiang bamboo is used for blowpipes as it has long inter-node spacing, is quite thin, very light and grows straight (what more could we ask for!). 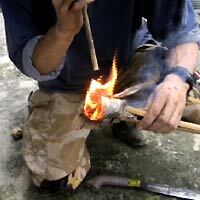 The mouth piece is made separately (usually from a piece of wood) and the bamboo is hardened (using fire). The blowpipes are often decorated with rattan weaving and/or carvings. I am not sure on this, but I believe that in other parts of Malaysia they also make blowpipes from wood as well (as you described)….but, as you say, it must be a lot of work indeed! I have two blow pipes (made by orang asli) and one is straighter than the other! But both are very effective. The poison itself is made from the sap of the Ipoh tree (often mixed with other poisonous roots from creepers). This mixture is cooked into a thick paste (then smeared onto a bamboo stick) and, when needed, moistened and applied to the dart. The Orang Asli mainly use blowpipes to hunt small game (like monkeys and squirrel), with larger game (like wild boar) it’s not really that effective a technique. I’ll do a video on blowpipes at some point, but hope this answers your questions for now. check out this link for more details on the bamboo strike-a-light. Thanks for the great link – that’s going to be big help and there’s loads of info there. The first time I read about this technique was in a book called “Stranger in the forest” by Eric Hansen. It’s a terrific book about this guy who walked across Borneo (in a pair of sneakers!) with some Orang Asli as guides – it’s well worth a read if you are interested in the jungle and very entertaining. Yes, Ipoh(antiaris toxicaria) poison is antiarin, a cardiac glycoside-causes a fatal arrhythmia in its victim. Here curare is used, from a vine in the moonseed family called Chondrodendron tomentosum and several vines in the streychnine family genus strychnos(these actually have no strychnine). What they do have are curarine alkaloids which cause flacyd muscle paralysis(makes monkeys fall from the trees) and eventual death from asphyxia when the diaphragm becomes paralyzed as well. Also used for small to medium size game. Larger game was speared, shot with arrows or trapped. Hi Gabriel, You really know your stuff!! I had to go away and look up arrhythmia as I wasn’t sure what it was (!) and hadn’t realised that that was how antiaris toxicara worked….so many thanks for pointing it out. Loved the vid like all the others. I too carry little pieces of charcoal in my kit. One problem I had in in the Pacific Northwest US because of the wetness and high humidity was my char material absorbing the moisture. I made my tin absolutely water/air tight by using some inner tube on the rim of the container. Since you love inner tubes too this might help make a great seal on your bamboo if you encounter this same problem. 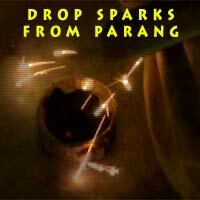 I learn something all the time like getting a spark from certain species of bamboo. I didn’t know that could be done. Thanks for the info and to Gabriel for his info to put in my memory bank. Simply place the charcloth on top of the flint (with the edge overlapping a mm or so) and strike downwards – most of the sparks are sent flying upwards where, with a bit of luck, they catch on the edge of the charcloth. There are loads of videos on Youtube showing this in detail.